[148 Pages Report] The aircraft evacuation market is projected to grow from USD 1.30 Billion in 2017 to USD 1.73 Billion by 2022, at a CAGR of 5.96% during the forecast period. The base year considered for the study is 2016 and the forecast period is from 2017 to 2022. The report analyzes the aircraft evacuation market on the basis of aircraft type (narrow body aircraft, wide body aircraft, very large aircraft, regional transport aircraft, business jet, helicopter, and fighter jet), equipment type(life vest, evacuation slide, ejection seat, evacuation raft, and emergency flotation), and fit (linefit and retrofit). These segments and subsegments have been mapped across major regions, namely, North America, Europe, Asia-Pacific, and the Rest of the World (RoW). The report provides an in-depth market intelligence regarding market dynamics and major factors influencing the growth of the aircraft evacuation market (drivers, restraints, opportunities, and industry-specific challenges), along with an analysis of micromarkets, with respect to individual growth trends, future prospects, and their contribution made to the overall market. The report also covers competitive developments, such as long-term contracts, new product launches & agreements, and research & development activities in the aircraft evacuation market, in addition to business and corporate strategies adopted by key market players. The market size estimation for various segments and subsegments of the aircraft evacuation market was arrived at by referring to varied secondary sources, such as OMICS International, European Defence Agency, market outlook and corroboration with primaries, and further market triangulation with the help of statistical techniques using econometric tools. All percentage shares, splits, and breakdowns were determined using secondary sources and verified through primary sources. All possible parameters that affect the market have been accounted for, viewed in extensive detail, verified through primary research, and analyzed to acquire the final quantitative and qualitative data. This data is consolidated with detailed inputs and analysis from MarketsandMarkets, and presented in this report. 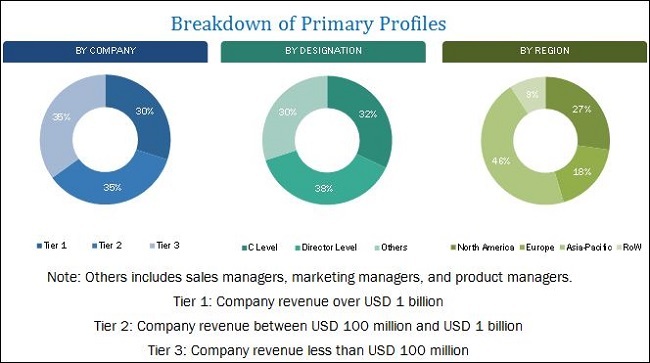 The ecosystem of the aircraft evacuation market comprises raw material suppliers, manufacturers, distributors, and end users. Some of the key players in the aircraft evacuation market are Zodiac Aerospace (France), Martin-Baker (U.K.), UTC Aerospace Systems (U.S.), EAM Worldwide (U.S.), NPP Zvezda Pao (Russia), Trelleborg AG (Sweden), and GKN Aerospace Service Limited (U.K.), among others. These players have adopted strategies, such as contracts, new product developments, and agreements to strengthen their position in the aircraft evacuation market. The aircraft evacuation market is projected to grow from USD 1.30 Billion in 2017 to USD 1.73 Billion by 2022, at a CAGR of 5.96% during the forecast period. Increase in situational awareness to drive operations and rise in demand for real-time analytics are the key factors that are expected to drive the aircraft evacuation market. The market has been segmented based on aircraft type, equipment type, fit, and region. Based on aircraft type, the aircraft evacuation market have been segmented into narrow body aircraft, wide body aircraft, very large aircraft, regional transport aircraft, business jet, helicopter, and fighter jet. Based on aircraft type, the narrow body aircraft segment is expected to lead the aircraft evacuation market in 2017, and is expected to continue its dominance during the forecast period. According to Boeing’s Current Market Outlook 2017, the global fleet size of narrow body aircraft is 14,870, which is anticipated to reach 32,280 aircraft by 2035. Asia and North America have the largest fleet of narrow body aircraft with 4,540 and 4,010 aircraft, respectively. Increase in demand for narrow body aircraft globally is driving the aircraft evacuation market. Based on equipment type, the aircraft evacuation market has been segmented into life vest, evacuation slide, ejection seat, evacuation raft, and emergency flotation. The evacuation slide segment is anticipated to grow at the highest CAGR form 2017 to 2022. As the adoption rate of evacuation slides is 100% in all commercial passenger aircraft coupled with increased demand for new aircraft, the evacuation slide segment is projected to lead the aircraft evacuation market. The civil aviation industry across the globe has witnessed strong growth in recent years, driven by factors, such as increase in air travel, rise in disposable income, and growth in international tourism, among others. The aircraft evacuation market has been segmented and analyzed on the basis of fit into retrofit and linefit. The linefit segment led the overall aircraft evacuation market, and is expected to exhibit a similar trend during the forecast period. The linefit segment is increasing continuously due the demand generated by new aircraft orders globally. 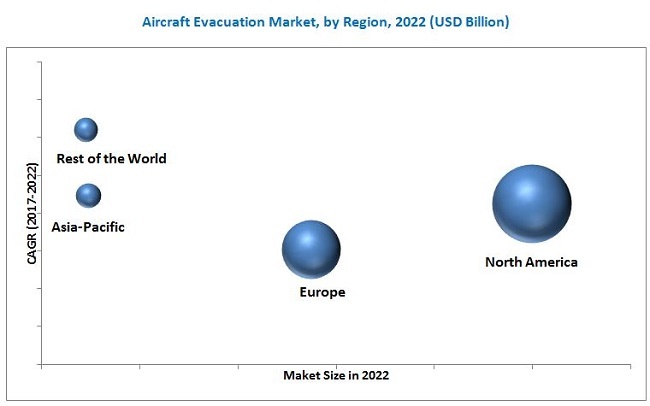 The aircraft evacuation market has been studied for North America, Europe, Asia-Pacific, and the Rest of the World. North America is estimated to lead the global aircraft evacuation market in 2017. The aviation industry is one of the most profitable industries in North America, with major aircraft manufacturers, such as Boeing (U.S.), Bombardier (Canada), Lockheed Martin (U.S.), Bell Helicopter (U.S.), and Sikorsky Aircraft (U.S.) present in the region. These manufacturers help generate the demand for aircraft evacuation. Airlines are also playing a significant role in generating the demand for aircraft evacuation through retrofit. North America is expected to continue its dominance during the forecast period. Authorization from FAA and local aviation regulatory bodies is one the factors restraining the growth of the aircraft evacuation market. Products offered by various companies operating in the aircraft evacuation market have been listed in this report. Recent developments and contract in the report include essential products developed and contracts undertaken by various companies. Major players in the aircraft evacuation market are Zodiac Aerospace (France), Martin-Baker (U.K.), UTC Aerospace Systems (U.S.), EAM Worldwide (U.S.), NPP Zvezda Pao (Russia), Trelleborg AG (Sweden), and GKN Aerospace Service Limited (U.K.), among others. 12.10 Survival Equipment Services Ltd.
12.11 Switlik Parachute Company, Inc.